The pedestrian bridge under construction in Sweetwater, Fla., on the outskirts of Miami, collapsed at 1:30 pm, Thursday, March 15. Crushed under the rubble may have been up to 10 vehicles. Ten people were taken to the hospital. Six people have died. Engineers study disasters with the hope of understanding how new designs, construction methods and processes can fail, or if best practices were observed. While the full facts of the case may not be known for over a year, many engineers have begun studying the drawings and video of the bridge disaster to try to understand what went wrong and shed light on possible mechanisms of failure. Their discussion starts here. The bridge was to have provided students from Florida International University’s (FIU) Sweetwater campus safe passage across the eight-lane SW 8th St, aka SR41. A student had been killed by a motorist last August trying to cross the busy highway. About 4,000 FIU students live off campus in the town of Sweetwater. Due to be completed in 2019, the bridge would have connected the campus to a complex of student apartment towers being planned. 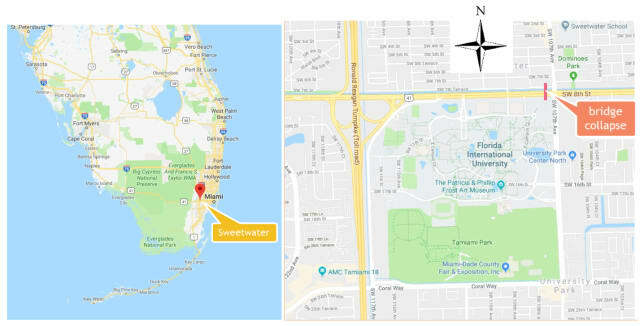 FIU and the city of Sweetwater obtained a $14.2 million U.S. Department of Transportation grant to create the bridge, hired FIGG Bridge Design to design it and MCM Construction to build it. 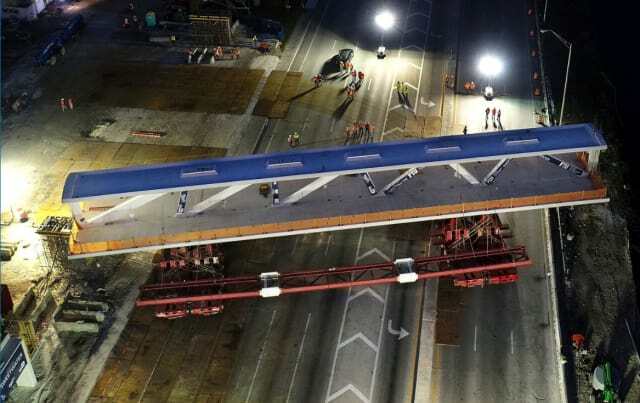 On Saturday night, the road was closed and a 175 ft-long prefabricated section of the bridge was moved into place, coming to rest on two supports on either side of the highway. On Sunday morning, the road was opened for traffic. On Tuesday, FIGG engineer Denny Pate left a voice message to a Florida Department of Transportation (FDOT) employee saying there was “some cracking…observed on the north end of the span” and advised something be done to repair the bridge, though he also added that he did not think it was a safety issue. That message went unheard until Friday, said an FDOT official. Just about coincident with the start of the meeting above, an FIU employee in his car heard a loud “cracking whip” sound, seeing a nearby construction workers with a look he interpreted as “Um, that’s not normal.” The bridge was reinforced with steel cables throughout. Could one of them have snapped? 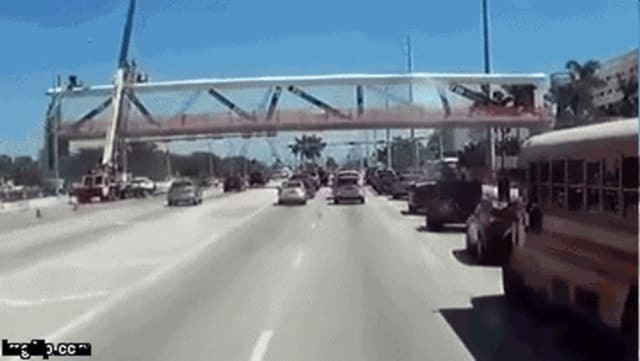 At 1:30pm, as four lanes of vehicles waited in four lanes under the bridge section for a light to change and at least two lanes had moving vehicles turning from or onto SW 8th St, and as workers were on top of the bridge, the 175-foot, 950-ton section cracked and came crashing down, crushing people in their vehicles. The Earth shook, said one observer. 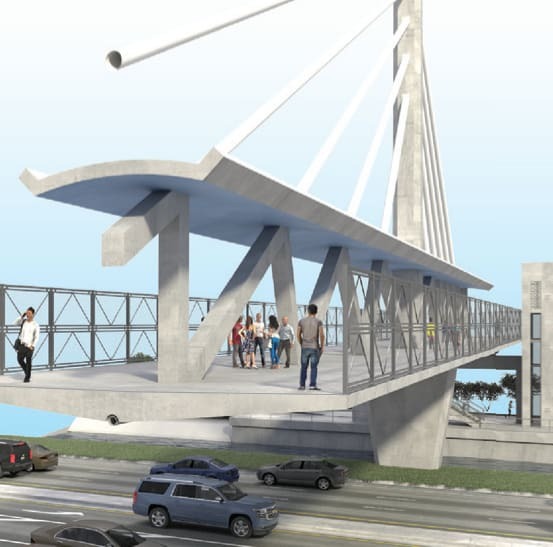 The pedestrian bridge was to have been an “innovative signature bridge”, according to the proposal presented to FIU officials by MCM and FIGG Bridge Group. FIGG is well-respected in the bridge building community. The company may be best known for the Seven Mile Bridge in the Florida Keys and, also in Florida, the Sunshine Skyway Bridge, a four-mile-long cable-stayed bridge across Tampa Bay. The FIGG company has a 40 year history of bridge design without failure, says a FIGG representative. Not entirely true, said the Virginia Pilot reporting on a Jordan Bridge mishap when the company was fined for violations after a 90-ton piece of concrete fell to the ground. MCM has endured worse. It has been inspected eight times by the federal government since 2013 and fined on four occasions, according to the Miami Herald. Concrete Trusses a Bad Idea? A cable-stayed bridge employs cables attached to one or more towers to support the bridge deck at several points. The ease of construction of cable-stayed bridges (compared to suspension bridges) and their aesthetics make them the most sought after type of modern bridges. Understandably, FIU wanted the cable-stayed look for their “signature” bridge. But the FIU bridge was going to be a hybrid between a pure cable-stayed and a truss bridge (swaying more to the latter). The spans on both sides of the tower, the 175-foot section that collapsed, and a shorter one over a waterway, employ diagonal truss elements. Most truss bridges employ a truss structure on both sides of the deck. Most truss bridges also use steel. The FIU bridge has a truss structure that runs down the center of the walkway. 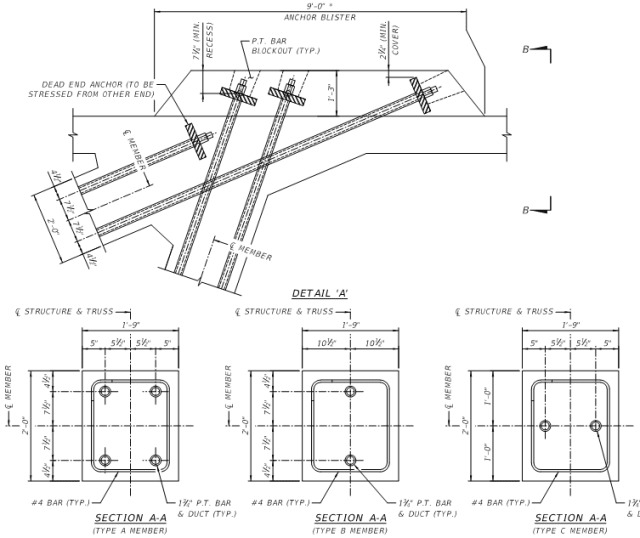 A cross section of the walkway resembles an I-beam. Also, the FIU bridge is made of concrete. Concrete trusses don’t get much love from structural engineers on the Eng-Tips forum, who seem to prefer steel for trusses, given its relative strength and because steel bridges, if they are going to fail, provide more of a warning. Metals, being ductile, fail slowly under tension. Concrete fails suddenly, catastrophically. “Concrete trusses are rare, and for good reason,” said a structural engineer who goes by hokie66 on Eng-Tips. With an I-beam supported on both ends and with a downward load (even its own weight) the top of the I-beam is in compression and the bottom in tension. Concrete, being good in compression but lousy in tension, gets help from steel tendons. In the deck were 12 strands of steel tendons. The truss members also contain steel tendons. The cables, in this case, were really pipes. The plans show no steel cables inside, which are common with cable stayed and suspension bridge design. It is not known if the cables/pipes from the towers would have prevented the total collapse of the 175-ft main span. The location of the failure, off to one side, rather than the middle, is making engineers scrutinize that part of the structure. Dashboard video show a crane on the road and worker(s?) on top of the span. Workers may have been adjusting tension to these steel tendons, said engineers reviewing pictures and videos of the disaster. This was confirmed by National Transportation Safety Board investigators on the scene. “Crews were tightening tensioning cables in a diagonal truss at the north end of the bridge on the day of the collapse,” reported the Miami Herald on Saturday, although that may not be the reason it collapsed—or the only reason—according to the investigators, who may take as long as 18 months to complete their investigation. The north side of the bridge was where FIGG engineer Denny Pate had noticed cracking. He left a voice mail on Tuesday on a landline for an FDOT employee. FDOT explains that the employee was in the field and did not return to the office and get the message until Friday. 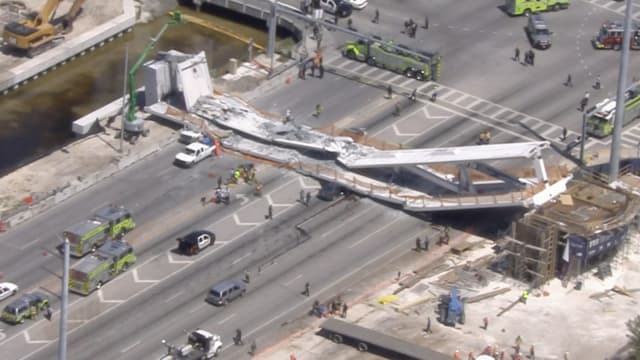 The disaster is also bringing attention to accelerated bridge construction (ABC), which some call “instant bridges” and was used for the FIU bridge. ABC entails that a bridge, or parts of the bridge, are made somewhere offsite (usually nearby) and then moved into place. In use for decades, ABC’s main advantage is that traffic is not affected except for during a short time when the bridge part is moved into place. Proponents of ABC also cite safety of construction crews, who can work in a sheltered area for most of the construction time. ABC is the best way for constructing bridges, according to bridge officials, such as those for San Francisco’s Golden Gate Bridge, which had several sections of its deck assembled off-site and dropped into place. The FIU bridge’s main span was built on the side of SW 8th St, then moved into place in a five-hour overnight operation. A prefabricated reinforced concrete section, mostly complete, able to be supported on two piers, placed during an overnight operation instead of causing months of traffic issues from traffic rerouted from a major highway… it must have sounded ideal to city planners. 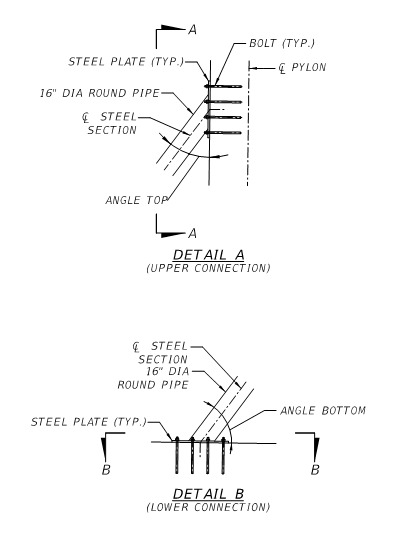 Section showing “anchor blister” on top of the pedestrian walkway, orientation of strengthening cables and interface for post tensioning equipment in the area of structural failure. Reports from the scene of the disaster are pointing to post-tensioning as one of the reasons for the structural failure of the FIU bridge. Post tensioning was called for in the prefabrication stage, before the span is placed over traffic. However, post tensioning can also occur when pre-fab sections are in place and even after, bridges are operational. It is a process done by professionals and with sophisticated equipment. VSL, the company contracted for the post tensioning (PT), is a highly regarded specialist, with over 50 years of post-tensioning experience, according to Eng-Tips member Ingenuity. Could they have been caught by surprise by a bridge that may have been weakened by cracking, cables under the deck that weren’t doing their job, or another reason that would have reduced the margin of safety they were counting on? How exactly did the parts of the bridge fail? This is sure to be the main thrust of the investigation being conducted by the NTSB. Observant engineers have already started the discussion as to possible sequences of failures in different elements that could have led to the total failure, centering on the diagonal members of the truss sections that may have been tensioned. 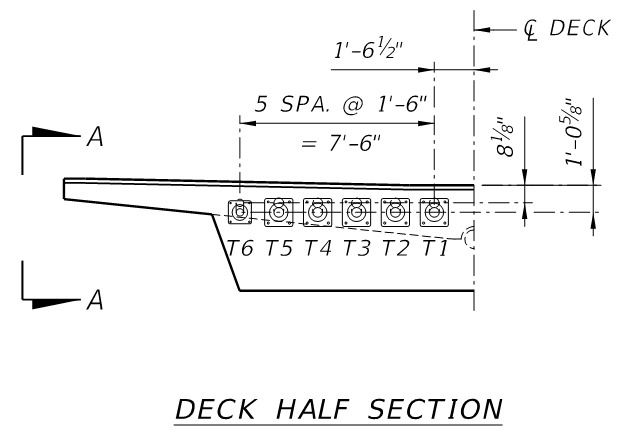 Deck half section shows steel strands making 12 tendons in the deck of the walkway. Longitudinal bottom-flange PT: 10 groups of 19x0. 6" dia, 7-wire strands, GROUTED tendons typically, except T6 were 12 strand tendons. These tendons were fully stressed, capped and grouted BEFORE transportation. How much could the “cables” of the “cable-stayed” design have helped if they were in place? From the detail drawings, the collapse would have been resisted only by bolts in concrete. The pipes attach to the top of the roof of the span, not the deck. The angle of the pipe to the roof for the particular area shown would have rely on the pullout strength of the bolt in concrete—which is marginal. Real cable-stayed bridges may use pipe but inside are steel cables that attach more securely to the towers and the deck of the bridge. This furthers the claim that the cable stayed design was almost entirely for show, an attempt to make a “signature bridge” and a landmark for the town of Sweetwater. Would the look of the faux-cable stayed bridge have contributed to a false sense for motorists underneath and pedestrians on it? Could it have lulled FIU, FDOT and city officials into believing the bridge would have most of the strength of cable supported bridges, from a company famous for designing them, discounting that for months it would have been a naked 950-ton concrete slab overhead, not as a bridge at all but a dead fall trap for unwary and unprotected motorists?